Spider-Man: Homecoming is exceptional in many ways. I don’t watch many movies in theaters, but this is one that I made an exception for. Twice. It’s a reboot and the sixth Spider-Man film in the past 15 years, but it feels like the freshest, most exuberant take on the character yet. It’s not an origin story, but it manages to have a better coming-of-age story for Peter Parker than even the original Spider-Man. This is a special film. The way I know that is because I’ve already seen it twice, and I still can’t wait to see it again. Very few movies make me crave more, and this is one of them. I went into the film the first time without knowing anything detailed about it. I had seen Captain America: Civil War and an early trailer for it, but I hadn’t read any reviews and I didn’t know what to expect. I’m so glad I did that because the movie surprised me and delighted me the whole way through. There were many times when I found myself dumbfounded by how the movie kept getting everything right about Spider-Man. I’m going to share everything I love about this movie without giving away any spoilers because I want you to know what you have to look forward to. If you’ve already seen it, then this will be a fun reminder of just how great the film is. The kids in the film look and act like kids. I never really bought that Tobey Maguire and his fellow young actors were actually high-schoolers in the first Spider-Man. In Spider-Man: Homecoming, Peter and his best friend remind me of Tom Hanks and his best friend in Big. They have an innocent obsession with Star Wars Lego sets, they talk about geeky things, and they are hilariously naïve about the way the world works. The movie is treated as a comedy. Never before has a Spider-Man film taken the time to throw in as many jokes as this one. It comes across as extremely lighthearted and small scale while also being more meaningful and interesting than almost any other film in the series, except maybe Spider-Man 2. The villain is likable and actually has a plan that is both sustainable and reasonable. A big problem with previous Spider-Man films is that their villains’ goals have been nebulous. Green Goblin wants Spider-Man to team up with him or something. Doc Ock wants to build his fusion reactor because his mechanical arms are manipulating his mind. Venom and Sandman want to take revenge on Peter. The Lizard wants all New York residents to turn into lizard people. New Goblin and Electro want to take revenge on Spider-Man for perceived slights. The Vulture, on the other hand, is running a business that’s lasted for eight years. He has a perfectly logical motivation that isn’t influenced by any degree of insanity or anything like that. He’s just a working-class guy who wants to take care of his family and employees and is tired of being stepped on by the big shots. There are many surprises in this film. It never gets dull and it keeps showing the audience that it’s got a million tricks up its sleeve. I had never thought that Spider-Man was limited in his abilities, but this film shows that there is so much untapped potential to what he can really do after he disables a few safety protocols on his suit. Peter’s back-and-forth banter with the female version of Jarvis from Iron Man is perfect. Plus, she’s voiced by Jennifer Connelly, who is married to Jarvis voice Paul Bettany. It couldn’t be better. The film isn’t burdened by Uncle Ben’s death. Peter never mopes or acts like he has the weight of the world on his shoulders because, after all, “with great power comes great responsibility.” Instead, he’s free to just be a kid and act childishly and brashly at times. His story revolves around his relationship with Tony Stark, and the payoff to it is wonderful. The movie takes my advice and has Peter leave the city quite a few times during the film. He doesn’t scale any mountains, but it is awesome seeing him climb all the way up the Washington Monument. And he actually treats these incredible heights the way anyone else would. He’s scared of being too high up because, despite his superpowers, he’s still mortal. We don’t usually see Spider-Man get petrified with fear as he attempts to web-sling, and it’s a welcome sign of his humanity in this film. Plus, we get to see how he makes do in the suburbs away from any tall buildings. It does something with the love story that no other Spider Man film has ever done before. 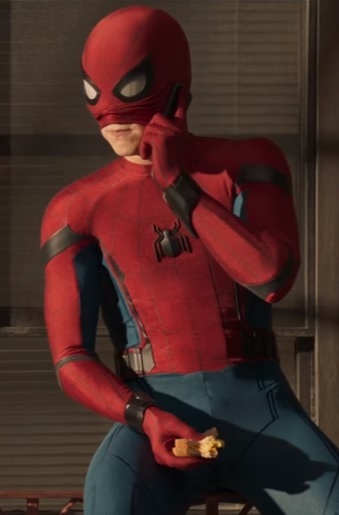 In most Spider-Man films Mary Jane and Gwen Stacy are either damsels in distress or they have very little connection to what’s going on at the climax except by inserting themselves directly into harm’s way. This one is different. This love story is innocent and sweet while, at the same time, doing something that you would never expect. I can’t say anything else about it, but just know that it is different and great. Whenever Peter’s social life takes a hit because of his superhero alter-ego, it’s never frustrating and or ham-fisted. It feels completely natural and it’s incorporated seamlessly into the story. His frequent disappearances and flakiness play a pivotal role in the climax of the film on the way to the titular Homecoming dance. The ending offers three big surprises in quick succession. Starting with the final Science Club meeting, we get three amazing surprises that made me want to stand up and cheer. Seriously, they are all worth the wait. 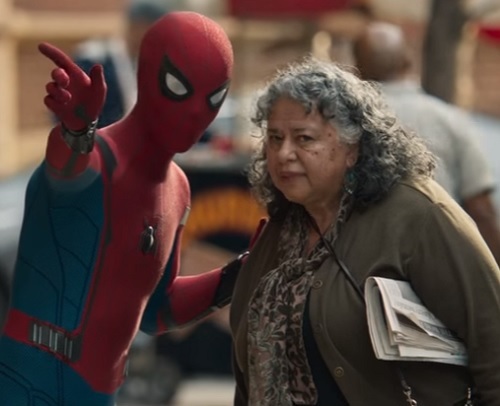 Spider-Man: Homecoming stands out as a great film, not just in the comic-book genre, but across multiple genres from teen comedy to action and fantasy in general. I can’t say enough good things about it, and if this is any indication then bring on Spider-Man: Prom. This entry was posted in Movies That Improve and tagged action movies, comedy, comic books, films, fun, funny, humor, movie reboot, movie review, movies, relationships, science fiction, spiderman. Bookmark the permalink.